Game theory analysis can be useful in examining how people use groupware. Groupware is computer software designed to help people work together to achieve common goals. Examples include Facebook, email, electronic calendars, and google docs. Each of these systems require users to put in an a certain amount of work (post updates/photos/comments, write emails, update calendars), and all users can see the resulting network of information (see what all of your friends are doing, be able to interact with all of your co-worker’s calendars). However, once these systems are analyzed as a game, it’s clear implementing these systems can have some issues. Let’s focus on one particular example: talking with people online on Gmail chat. The work you put in is setting your status appropriately – online, away or offline. Once all of the users have done this, you know that you can talk to anyone that’s shown as online at the moment. However, you probably shouldn’t talk to users who are marked as away, since they are otherwise occupied. The problem with always being truthful and saying that you’re online is that other people can negatively affect you. Instead of just talking to the people you like, people you don’t want to talk to can interrupt you. So, what does this mean? For (Online, Online), both users set their status correctly to online. This is what the developers expect. 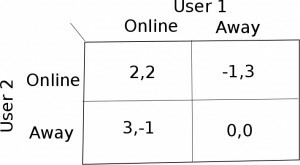 For (Online, Away) and (Away, Online) one user sets their status to away, while the other sets their status correctly to online. Notice that the user who is set to online doesn’t know that the other user is online as well, and therefore does all the work (-1), but can’t talk to the other person (doesn’t get the +3). However, the user who is set to away can see who’s online – they can talk to everyone they want to (+3), but don’t have to deal with the annoyances of being labeled as online (doesn’t get the -1). Lastly, for (Away, Away) nobody gets a payoff, since no one is shown as online, so nobody talks to one another. The Nash equilibrium for this payoff matrix is (Away, Away)! Both users have a strict best response to always state that they’re away, and no conversations happen. Therefore, Google chat is an example of the Prisoner’s Dilemma game. This can also be applied to other types of groupware as well. For example, lets look at electronic calendars. It takes effort to update your calendar (payoff -1), but if you can see someone else’s calendar it’s easier to schedule meetings with them (payoff +3). The payoff matrix is the same as above, given the options to set up a calendar or not set up a calendar. The Nash equilibrium is also the same: no one sets up a calendar. Thus, companies often have to mandate that all of their employees use the groupware to make it effective.